Apple has released iTunes 10 with Ping, a new music-oriented social network for following your favorite artists and friends to discover what music they’re talking about, listening to and downloading. iTunes Ping lets you post your thoughts and opinions, your favorite albums and songs, the music you’ve downloaded from iTunes, plus view concert listings and tell your friends which concerts you plan to attend. 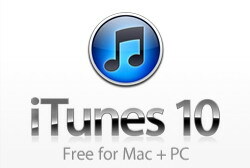 iTunes 10 also features HD TV show rentals* for just 99 cents an episode and AirPlay wireless music playback. Ping lets you follow your favorite artists to see what they’re up to, check out photos and videos they’ve posted, see their tour dates and read comments about other artists and albums they’re listening to. You can also create a profile on iTunes to let your friends know who you’re following, what you’re listening to and which concerts you’re going to. 0 comments on "iTunes 10 available for download"